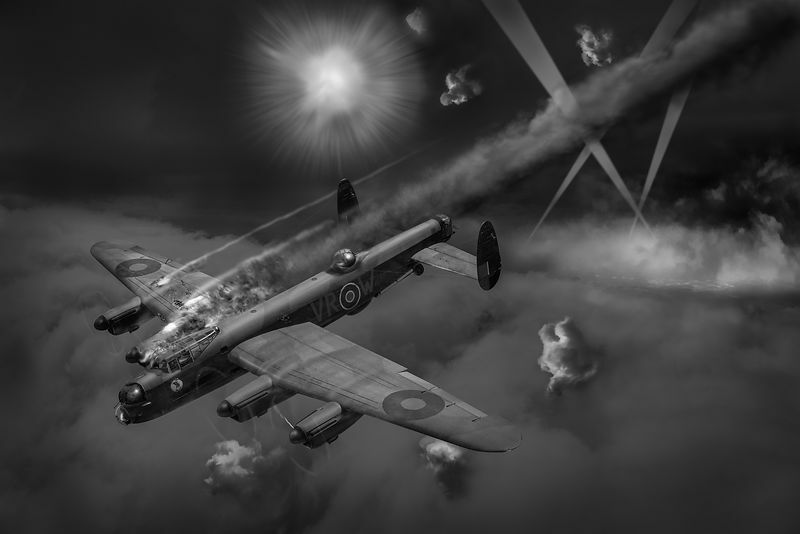 Avro Lancaster B.X KB799 of 419 Squadron RCAF going down in flames early on 15 January 1945 after being hit by flak while bombing the German synthetic oil factories at Merseberg, 60 miles south-east of Berlin, near Leipzig. One engine eventually stopped and was feathered; the fuel tanks were holed in the other wing, which was on fire. The pilot, F/O Roger Vatne, made a series of dives to try to blow out the flames and headed for Allied lines in France. But after about 100 miles it was clear it was not working and he ordered the crew to bail out. At about 12,000ft, following their well-rehearsed drill, the two gunners left by the Lancaster's rear door; the others by the forward hatch. Last out was the bomb aimer, F/O "Norm" Hoas. Descending by parachute, they saw KB799 blow up. Only a couple of weeks later did they discover that their skipper, 21-year-old Roger Vatne, had still been in it at the time. The others were all eventually captured and became prisoners of war. A commission by members of the bomb aimer's family.